Click in to view our all new video tour! This tastefully extended and deceptively spacious four bedroom detached house boasts an array of extraordinary features, including a 32'5 orangery style dining/entertaining area, a 19'6 modern fitted kitchen with separate utility room, 17'4 lounge, 14'7 sitting room, luxury four piece bathroom suite and en suite to the 15'10 master bedroom. 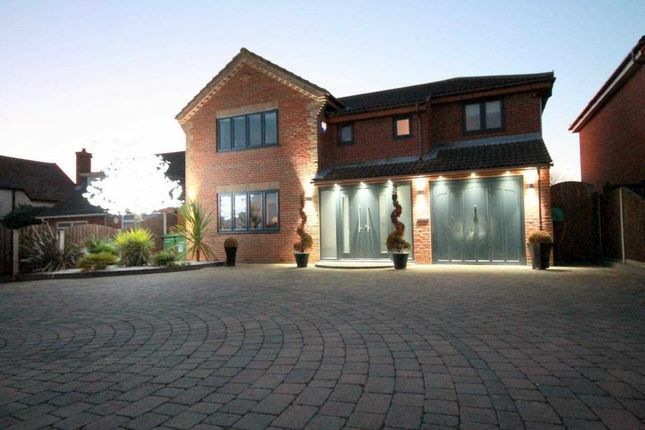 External features also include a block paved driveway providing enclosed parking for up to ten vehicles, low maintenance landscaped rear garden with artificial lawn, swimming pool and brick built outbuilding providing gym and chancing room space. Situated in a non estate Great Clacton position the property is ideally located within easy reach of local primary schools, Clacton factory outlet, nearby bus stops and nature reserves. In the valuers opinion internal viewing is essential to fully appreciate the accommodation on offer. Luxury fitted comprising low level w.c., vanity wash hand basin with mixer tap, skimmed ceiling, heated towel rail, wood effect floor covering. Coved and skimmed ceiling with inset spotlights, double glazed window to front, radiator, open access to lounge. Coved and skimmed ceiling with inset spotlights, feature fireplace, radiator, double glazed patio style doors to dining/entertaining area. Skimmed ceiling with inset spotlights and sound system, orangery style lantern, feature fireplace, further granite work surfaces with base units and built-in fridge beneath providing bar area and additional seating space. Two sets of double glazed French style doors with double glazed side panels to rear, wood effect floor covering with under floor heating. Rolled edge work surfaces with matching base and eye level units, wall mounted gas boiler, space for washing machine and tumble dryer, radiator, courtesy door leading to garage space. Luxury fitted three piece suite comprising enclosed shower cubicle, vanity wash hand basin, enclosed low level w.c., double glazed frosted window to front, double airing cupboard, heated towel rail, wood effect floor covering. Coved and skimmed ceiling with inset spotlights, double glazed window to front, radiator, full length built-in wardrobes with down lighters, wood effect floor covering. Coved ceiling, double glazed window to rear, built-in wardrobes, radiator. Luxury fitted four piece suite comprising freestanding bath with feature tap, double walk-in shower, vanity unit incorporating low level w.c., and wash hand basin, skimmed ceiling with inset spotlights, double glazed window to front, feature towel radiator, wood effect floor covering. The property enjoys a low maintenance rear garden measuring approx. 70' in depth, being enclosed by panelled fencing with feature patio area and artificial lawn. Brick built outbuilding currently used as gym/changing room space, separate boiler room, swimming pool, timber shed, gated side access leading to front. The front of the property is enclosed by brick wall and iron gates. Being mainly block paved with feature shingled areas, there is enclosed parking for up to ten vehicles. Accessed via up and over door with power and light connected. The Agent has not tested any apparatus, equipment, fixtures and fittings or services and so cannot verify that they are in working order or fit for the purpose. References to the Tenure of a Property are based on information supplied by the Seller. The Agent has not had sight of the title documents. A Buyer is advised to obtain verification from their Solicitor. Items shown in photographs are not included unless specifically mentioned within the sales particulars. We can also not confirm that such items are within the ownership of the seller. They may however be available by separate negotiation. Floorplans are for guidance purposes only and therefore not to scale. The agent has assumed relevant planning permissions are in place for any alterations the property has undergone and it is the responsibility of the seller to confirm this via their solicitor. Money Laundering Regulations 2003 - Any prospective purchasers' will be asked to produce photographic identification and proof of residential documentation once entering into negotiations for a property in order for us to comply with current Legislation.